By integrating spider DNA into the genome of an insect already geared up for industrial silk production, a spider silk industry might finally become possible. Oftentimes, nature is better at building stuff than we are. Spider silk is an example. 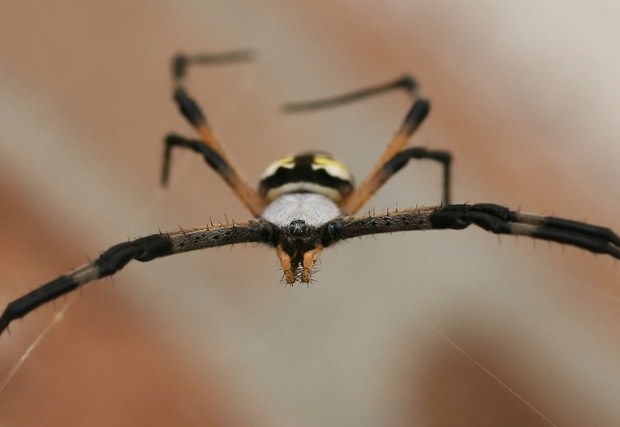 The tiny threads spun by our eight-legged friends has a tensile strength comparable to high-grade steel. If humans could harness the spider and turn it into a manufacturing agent, the industrial and commercial potentials could be immense. One problem, though: Spidey hasn’t been cooperating. Spiders just don’t spin the stuff in great quantities, and there is no commercially viable way of mass-producing spider silk. There is, however, already a silkworm industry, which yields most of the silk–less strong than the spider’s–that we’re familiar with. A few scientists got a bright idea: what if you could make the silkworm, which is already equipped for industry, spin spider silk? Notre Dame, the University of Wyoming, and Kraig Biocraft Laboratories, Inc. joined heads, and recently announced that they had succeeded in genetically engineering silkworms so that they produce artificial spider silks. Several biologists teamed up to splice certain DNA from spiders into the genomes of silkworms. The altered silkworms now spin cocoons that are a mixture of silkworm silk and spider silk. Though the tensile strength of the altered silk still falls well short of that of pure spider silk, it’s a step in the right direction. One of the biologists, Malcolm Fraser, even speculates that the bioengineered silkworms could someday spin silk even stronger than “native” spider silk. The potential applications of spider silk, or variations on it, run the gamut. Spider silk could be used for fine, strong suture materials and could help treat damaged tendons and ligaments. It might lead to better car airbags and athletic clothing. The stuff is so strong it could even be of use in bulletproof vests. (And beautiful enough to make tapestries, we reported last year.) Furthermore, if it replaces materials whose manufacture currently involves petrochemicals, spider silk manufacture could prove better for the environment, to boot. Our conclusion: Peter Parker could have been bitten by a lot of worse things. And though it’s early to say exactly what the effects of the new research will be, these Spiderworms seem to hold a lot of promise.